ALA > News > Improving Your Library’s Mobile Services, popular workshop returns! Improving Your Library’s Mobile Services, popular workshop returns! 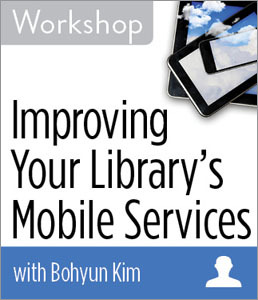 CHICAGO — ALA Publishing announces a new iteration of its popular workshop Improving Your Library's Mobile Services, with Bohyun Kim. This workshop will last 90 minutes and is hosted live at 2:30 p.m. Eastern on Wednesday, Apr. 27, 2016. Making your library’s website and resources more accessible to mobile devices like iPads and smartphones is essential. But if you’re new to the mobile web, it can be hard to know where to start and what guidelines to follow. In this workshop, Bohyun Kim will show you how to understand the mobile web with an eye towards expanding your library’s mobile services. After completing this workshop, you’ll understand the difference between the mobile web and the desktop web, the basic components of a library mobile website and how the mobile web has evolved in the last 2-3 years. You will be able to critically review and assess the efficacy of a given library mobile website, identify issues, and create strategies for improvement. Bohyun Kim is associate director for Library Applications and Knowledge Systems at the University of Maryland, Baltimore, Health Sciences and Human Services Library. She is the author of The Library Mobile Experience: Practices and User Expectations, a previous issue of Library Technology Reports, and editor of the ACRL TechConnect blog. Follow her on Twitter at @bohyunkim. Registration for this workshop is available on the ALA Store. You can purchase registration at both individual and group rates. ALA Publishing Workshops are designed to give you and your staff the opportunity to participate in a hands-on learning experience that will help you make the best technology decisions for your library.